Aminé is a young, up and coming rapper from Portland, Oregon who released his first mixtape in early 2014. Aminé became a well known name across the internet with the release of his song “Caroline”, which reached number 11 on the Billboard Hot 100 and was certified triple platinum by the RIAA. This lead to Aminé earning a spot as one of the ten members of the vaunted XXL “Freshman Class” in 2017. This was followed by the release of his debut album, Good for You, and his latest mixtape, EpLpMixtapeAlbum, which featured the hit “Reel It In”. The song “Blackjack” is his latest single, released on January 23rd, 2019, and is the fourth single off his second studio album, OnePointFive. The music video was released the same day, and has accumulated over 5.4 million views. Aminé wears black low top chucks in this music video. The track is a boastful celebration from Aminé about his wealth and success. He starts off the song by saying that he bought a new grill, a new whip, and a new drip (aka jewelry). He also talks about how he’s got shiny cuffs on his wrists, but they aren’t from cops, meaning he’s got fancy watches. Aminé’s flow is full of charisma, and the staccato beat helps accentuate his vocal mannerisms perfectly. This flow also makes it incredibly easy to sing along, and will have the hook stuck in your head all day. Showing off his grill, and stunting in the hallway. 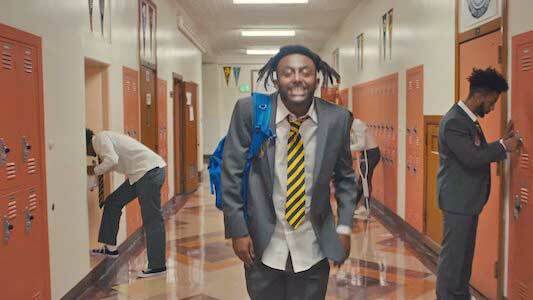 The music video is actually directed by Aminé himself, and is set in a “School of Rock” type boarding school. The school outfits are black, yellow, and grey, and come complete with black chucks on every student’s feet. This includes Aminé, who looks especially sharp in his uniform. These uniforms really give the boarding school vibe while being modern and stylish. 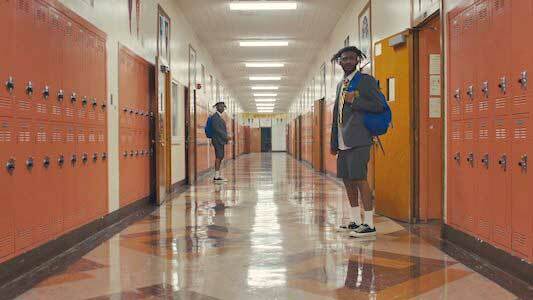 Aminé raps showing off his grills and bling, and runs around the school with his crew as one of his teachers chases them. There’s even a Scooby Doo style chase across hallways through multiple doors that’s hilarious and the highlight of the video. Overall this is another hit video for Aminé, and just shows that his creativity is going to be producing quality content for years to come. The whole school’s looking sharp in chucks. Use the links below to outfit your school in new pairs of chucks.